We’ve just posted an update to the multilingual glossary page. 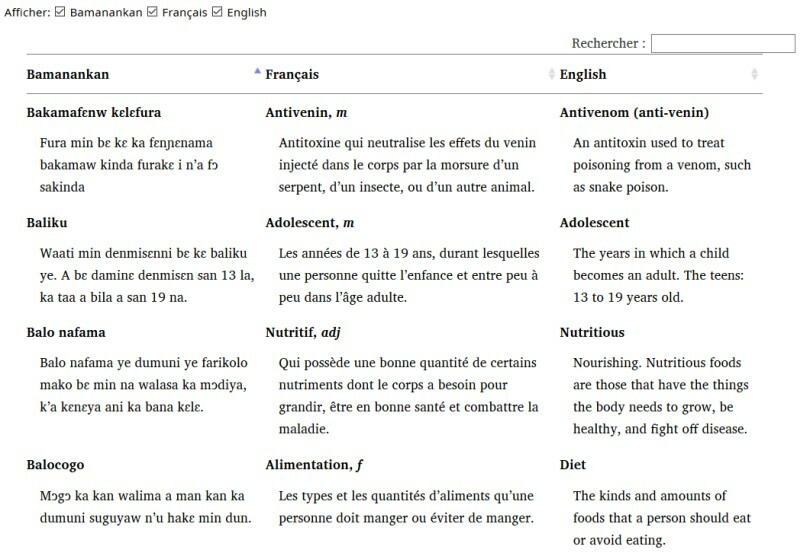 Now you can check the meaning of medical terms used in our new edition of Where There Is No Doctor in Bambara, French, and English. The new glossary is sortable (click on the language name in the header) and searchable (type something in the box next to “Rechercher.”) You can also hide a column (click the checkbox) and reorder columns to rearrange (click and drag the header row in the table). Please take a look! Hello! We’ve published a final ebook version of the Bambara edition of Where There Is No Doctor. The version in French is coming soon. This is an EPUB file, which you can read on virtually any e-reader, or on a computer using software like Calibre or many others.